A tale of two cities. Gloucester and London. A tale of two boys. Toby, saved from an African slave ship; Aaron, the illegitimate son of the heir to a great estate. The dramatisation of real life really excites me when it comes to literature. 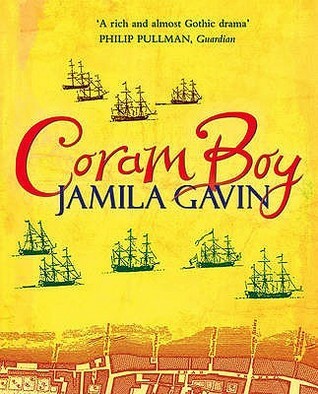 Coram Boy features the real Foundling hospital of the eighteenth century, and the Coram Foundation does in fact still exist today; this is one of the reasons why I picked Jamila Gavin’s novel to read (and study) instead of Philip Reeve’s Mortal Engines when it came to deciding between the two for an assignment. Having chosen it with such hope – it was, after all, shortlisted for the Carnegie Medal – I found myself a bit disappointed by the end of the book. It started off well – controversial (which can be exciting) and set in a time period I enjoy reading about, but only a few chapters in, it lost me. After that, it took me two to three weeks to build the enthusiasm to finish the two hundred and fifty pages I had left. I trudged through, reluctantly, unable to quite put my finger on what exactly I was having a problem with. Finally, I came to the conclusion that the writing style just didn’t agree with me. I’m unsure what age group the book was aimed at, but unlike The Bunker Diary (a very controversial book which I recently reviewed on The Geek Undergraduate blog), I felt that despite themes of child labour and murder, the third-person narrator described events in a tone that felt better suited to much younger teens. There is also not a lot of dialogue in the book, despite so many interactions between characters. Gavin makes use of the passive voice, which did become tedious when done repetitively. Saying that, I heard the book was adapted into a play, which I think would have been beautiful and I would be eager to see it if ever they performed it nearby, as music is a powerful tool in the story and I think it would translate well to stage. Personally, I would not recommend the book to a friend, but I can appreciate the difficultly for an author in finding the words to describe such tragic events to a young audience. Objectively, I think it is successful in what it was trying to achieve, which is most likely why it was shortlisted for the Carnegie Medal; it just wasn’t for me. There seems to be a theme of discribing tragic events in books aimed for younger teens and even children. I would like to have a look at this book to see how it compares to other books aimed at this target audience.